Florida is holding its first bear hunt in more than two decades, despite opposition from animal rights campaigners. 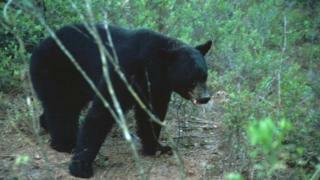 The state's Wildlife Conservation Commission is allowing licensed hunters to kill a total of 320 black bears. It said the aim was to stabilise the growing number of the animals. But activists said the state should instead focus on waste management and curbing the smell of food in garbage. More than 200 bears were killed on Saturday. The hunters included a 16-year-old boy who said he fulfilled a dream when he killed an 80kg bear. The Wildlife Conservation Commission said it issued nearly 4,000 permits to hunters. "There has been a need to make seasons longer, make them more liberal, because there have been so many predators and they're not as controlled as they should be," said Nick Pinizzotto, president and chief executive officer of the Sportsmen's Alliance. However, animal rights groups said the hunt was unnecessary and did not have public support. "Research overwhelmingly shows that hunting bears in the woods doesn't reduce problems with bears in neighbourhoods. The state would be better off helping citizens manage trash and outdoor food sources," said Kate MacFall from the Humane Society of the United States. Opponents photographed the dead bears as they arrived at designated delivery points in the hope that the images would undermine support for future hunts. The first bear to be killed was a lactating female, but the Wildlife Conservation Commission told the Orlando Sentinel newspaper the hunt had been timed so the youngest bear cubs would be about nine months old and able to survive on their own. Officials said the black bear population had grown to 3,500 - up from a few hundred in the 1970s - and presented a safety problem. At least four Florida residents have been injured in bear attacks in the past two years, mostly in the suburbs north of Orlando. On Friday a bear attacked a man near the town of Eastpoint, leaving him with non-life threatening injuries. Charlie Griffin told local TV that the 180kg bear emerged from a garbage dumpster and swiped at him, slashing him on the arm. In 2014, a black bear killed a hiker in New Jersey, the first fatal attack in the state in recorded history. The Wildlife Commission's advice on encountering black bears is to remain standing upright and speak to the bear in a calm, assertive voice while backing up slowly towards a secure area and leaving the bear a clear escape route.